Kaleme Translated by Persian Banoo: Incarcerated journalist, Mehdi Mahmoudian has written a report on the situation of the death-row prisoners in Rejaei Shahr prison. 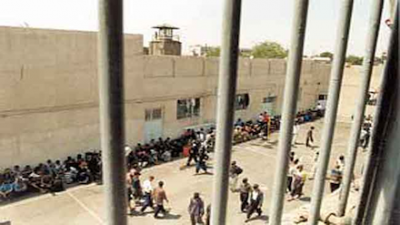 Mehdi Mahmoudian, a member of the Participation Front Party and the Society for the Defense of Prisoners Rights had exposed horrific and deadly conditions in the now closed Kahrizak prison. He had also reported onpost-2009 presidential election events. He is serving a five year sentence in Rejaei Shahr on charges of collusion with intent to act against the national security. For more than eight years now, every Tuesday he awaits to be called for execution. Many years ago in a dream he saw that he will be hanged on a Tuesday. Although more than seven years have passed since his death sentence was upheld, but he has lived with this nightmare for all these years. After three years of imprisonment in Iraq and Jordan, on July 31, 1999 he was handed over to Iran by the UN and subsequently was sentenced to death for the crime of hijacking an airplane. He was transferred to solitary confinement for the first time in 2003, but for reasons not known the implementation of his sentence has been delayed.Now with over 60 years of age, and up to nearly 9 years, he has been awaiting death and the gallows. The death penalty has always been a controversial human rights issue. More than 160 countries have abolished the death penalty in their penal code.However, in Iran and 41 other countries the death penalty remains in the penal code. And unfortunately Iran, proportionate to its population, with alarge difference, places at the top with the highest number of executions. What is most disturbing is the lack of fair and just procedures and trials for those sentenced to death. Especially those sentenced to death by the state, convicted on political, security and narcotics charges. They are often denied a defense attorney of their choice (they have to use court appointed lawyers), denied review of their case file prior to trial, and are deprived of fair and just trials. In cases involving Ghesas (retribution – In the Islamic Republic’s Penal Code, Ghesas is a death sentence that can be overturned by a pardon from the immediate family of the murdered. ), the influence of the plaintiff and/or the defendant has a large impact on the type and speed of implementation ofthe sentence. Despite having been built with a capacity of less then a thousand, it currently holds approximately five thousand inmates. This is unbelievable but is true. More than 1100 of them are under the death sentence. Today, October 23rd that I am writing this report, there are 1117 death row inmates, of which 734 are sentenced to Ghesas and the other 383 are sentenced to death, 14 of those are convicted on political and security charges. There are nearly one thousand inmates with life sentences and/or sentenced to over 20 years imprisonment. Many of these people were initially sentenced to death and had experienced the torments and tortures of being under a death sentence prior to their death sentence being overturned. I will leave the human rights and social discussions of the positive or negative effects of executions to the experts and for another time. But more painful and more inhumane than execution itself is the years of suffering and pain the individuals endure while awaiting an execution. Regarding those convicted of Ghesas, there is another matter that adds to their agony while awaiting execution. They are those who, often in a moment of anger during a fight, commit a murder. Apart from having to wait their execution for years, from time to time they are called for implementation of their sentence, and, as the procedure requires, the individual is placed in solitary confinement 24 hours prior to being taken to the gallows. But, for various reasons, they are given a stay of execution and are returned to their cell. According to an official data provided by the Judiciary the average time an individual remains on death row prior to implementation of the sentence isfive years, meaning that an individual on death row, on average is tortured for five years before execution. Needless to say, many of these convicts have suffered, and do suffer, these unbearable torments for much longer periods of time. I dare say that five years is the least amount of time that these individuals are tormented awaiting their execution. There is an office of Mediation Committee in all prisons to help resolve Ghesas cases and obtain pardon from the plaintiff, but in Rejaei Shahr thisoffice has been ordered closed by the Warden for over a year. More than 1,100 people are waiting to see the gallows in front of them. More then 1,100 individuals spend their days and nights with the nightmare of death. They all wish for something very small: To see a tree before they die. sickening what these Anti-monarchists are doing to Mehdi, No? it is not unlike what other anti-monarchists on the losing side had dreams of being able to do to the anti-monarchists who made it to power. The best way to help all these people, mehdi and the others, is to stop supporting or being an extremist. I really wish the winds of change come soon enough to save your life mehdi from the heart breaking inhumanity and crimes anti-monarchists committed 33 years ago and continue to committ against you and so many others who are totally innocent. This brave iranian, was born in 1979, the year of anti Monarchist Revolution. He was the first who wrote about rapes, tortures and murders of demosntartos post fraudulent 2009 "presidential elections" of Iran. He wrote how the bodies of those killed under torture were secretly burried or simply dumped in the deserts south of Tehran. since his arrest he has been severly tortured, kept in a cold cell with no clothing at all. he is very ill. This young man needs our help. sign the petition for him, below. The one and only way to end 34 years of uninterrupted human rights violations and barbarism by the Messianic Islamist Rapists, “reformers” and all, is regime change.